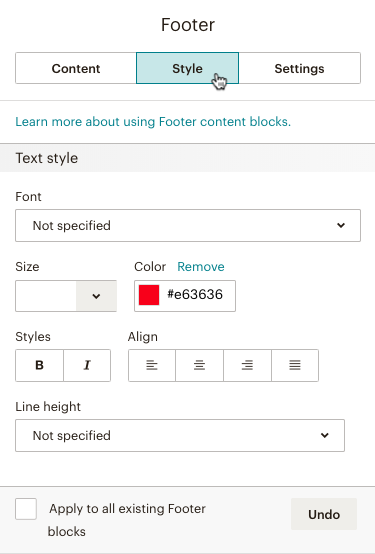 In this article, you'll learn how to use and edit Footer content blocks. To learn more about the required footer content, take a look at About Campaign Footers. When styling your campaign or template, keep in mind the hierarchy of design editing, so changes made in one area of the Campaign Builder do not override changes you want to make elsewhere. 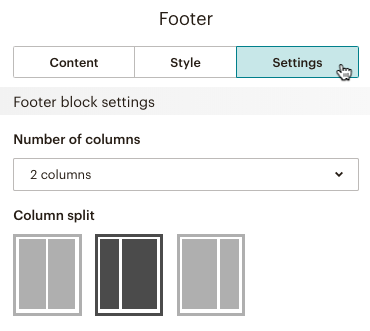 This article shows you how to insert a Footer content block in a Mailchimp drag-and-drop template. If you custom code your own template, read Customize Your Footer Content. If your campaign is missing the required merge tags, we'll automatically add a default footer that contains the merge tags to the bottom of your campaign. Learn more about troubleshooting the extra footer. 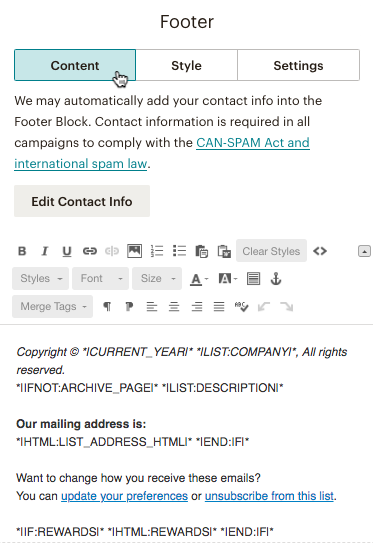 Default Mailchimp templates include a Footer content block in the bottom Footer section. Click the block to access its editing options, or drag and drop a new Footer block into your layout. To insert a Footer content block, follow these steps. 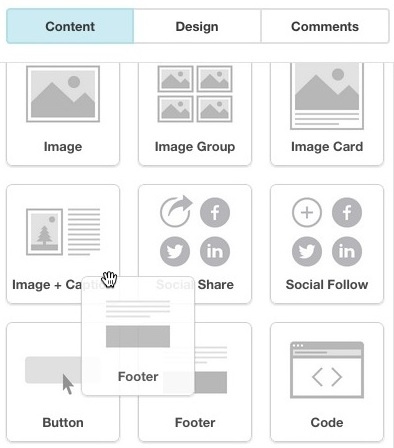 On the Design step, click and drag the Footer block into your campaign layout. In the editing pane, click to edit Content, Style, or Settings. The editing pane for the Footer content block contains three tabs: Content, Style, and Settings. Content This tab contains the text editor you'll use to update the block's content, and includes default merge tags that populate required and recommended information. Style This tab features editable drop-down menus for font color, style, spacing, alignment, and other elements. Settings This tab lets you change the layout and the number of columns. The default Footer content block uses system merge tags that pulls audience data into your campaigns. This includes a physical address and unsubscribe link, which are required by law, as well as a permission reminder, copyright notice, MonkeyRewards badge, and update profile link for subscribers. The block is designed to be used as-is, so you don't have to make any changes before you send. But, you can edit the text however you want, as long as you retain the required information. To edit your footer content, follow these steps. Click the Footer block you want to work with. Edit the text as needed, or click Edit Contact Info to change the physical address, permission reminder and other audience settings displayed in the footer. Learn more about required and recommended footer information, and how to use different merge tags, in Customize Your Footer Content. On the Style tab, you can format the font in your footer, as well as line height and text alignment. Remember, if you make style changes with the editor toolbar on the Content tab, the style settings on this tab will be overridden. To style your footer, follow these steps. Make your changes as needed and click Save & Close. The Footer block can be divided into two columns. This is useful if you want to separate unrelated footer information, such as your contact details and MonkeyRewards badge. To add a column to your footer, follow these steps. Click the Number Of Columns drop-down menu and choose 2 Columns, and set their width under Column Split. Return to the Content tab to make any line-by-line styling changes, and toggle between Column 1 and Column 2 to add and edit content. Every Mailchimp template is divided into separate sections: a Preheader, Header, Body, and Footer. When you apply style settings to a section, they affect all content blocks in that section. If you want to change the background color, border style, or link color inside your Footer content block, you'll need to apply those design settings to the Footer section as a whole.